Information security is a fundamental concern for every small and large business in today’s highly insecure digital environment. With the rapidly advancing technology, businesses are forced to deal with a plethora of new threats emerging after every few days. Having a robust and impenetrable Information Technology (IT) infrastructure is no longer a luxury but a necessity. Your business needs a secure IT architecture to support the confidentiality, availability and integrity of your company’s technological implementations and vital data. You need to make sure that your networks and the entire IT infrastructure are secured at both local and wide area levels. This is where Venkon comes in. We help you conduct a thorough Information Security Risk Assessment (ISRA) to identify, mitigate and minimize the risks associated with your information assets. Venkon’s Information Security Risk Assessment (ISRA) services are designed to help you make informed decisions in ensuring that your business is secure and meets data security compliance requirements. Your business is supposed to meet IT security compliance requirements such as the Payment Card Industry Data Security Standard (PCI DSS), the Health Insurance Portability and Accountability Act (HIPAA), and many more depending on the industry you operate in. Conducting an Information Security Risk Assessment will help you make informed decisions in both IT Security and IT Compliance. At Venkon, we understand everything about information security risks. Our goal is to impart the same knowledge to your team too. We’ll work closely with your team to identify and assess existing and potential information security risks in your organization or business. We have a team of security experts fully committed to your success. Our team holds a variety of industry-recognized certifications such as CISA, CISSP, CEH, and CISM, just to mention a few. We have years of experience in all forms of IT security, compliance standards, and security consulting expertise. 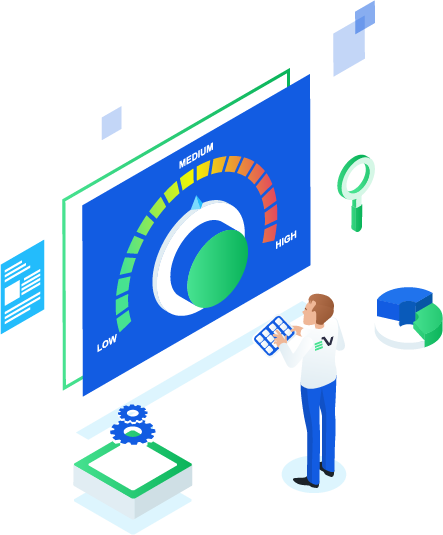 Venkon’s Information Security Risk Assessment service is designed to give you a practical and efficient roadmap for bolstering your organization’s security. We’ll help you establish the right security standards and set the framework for achieving compliance and the best security practices in your industry. What is an Information Security Risk Assessment? An Information Security Risk Assessment identifies and accesses important information security risks so companies and organizations can prioritize risks according to their importance. If organizations have budget constraints, they can carry out generalized assessments. However, if the results of the generalized assessment don’t provide enough information, then a more in-depth assessment is required. What is the Purpose of an Information Security Risk Assessment? It’s important to regularly conduct an information security risk assessment because the success of your business or organization’s activities depends on it. Every organization must ensure that all of its operations and IT frameworks are 100% safe from security lapses, loopholes, and outside interference. Running an information security risk assessment plays a key role in sustaining your organization’s overall security. It’s also worth noting that every single system, application, employee, or supplier has the potential to introduce a harmful cybersecurity risk to your business or organization. It’s therefore important to identify, assess, and quantify cyber risks as the first step to eliminating them. You must understand and assess information assets in your organization to help you accurately identify and address information security vulnerabilities existing in and around your business. What is Your Approach to the ISRA Process? Our approach in security assessment combines the best practices from leading security institutions such as the National Institute of Standards and Technology (NIST), ISO 27000 standards, Operationally Critical Threat Asset and Vulnerability (OCTAVE), and our industry-leading proprietary security assessment methods. Our risk assessment process typically takes the following steps: 1. Start by identifying all valuable assets in the organization that can be harmed by a cyber-threat resulting in a monetary loss. These assets include web servers, websites and landing pages, customers’ personal and financial data, credit card data, trade secrets, and much more. 2. Determine the magnitude of a successful cyber-attack or hacking attempt. Identify the financial loses the organization would suffer if one or more assets were to be compromised. The consequences could be in the form of monetary losses, data loss, system or application downtime leading to costly interruption of operations, and legal penalties of the attack. 3. Identify types of threats and their level of severity. We help you identify the threats and assign them a value of low, moderate, or high depending on the severity. 4. Identify vulnerabilities to determine the likelihood of exploitation by attackers 5. Create a risk management plan using the data collected during the assessment. Provide customized plans that address the unique security challenges that your organizations face. What is an Information Security Threat? An information security threat is anything that exploits a vulnerability to breach your security and harm your organization’s assets. Examples of threats include natural disasters, system failure, accidental human interference, and of significant risk malicious human actions such as hacking attempts, interference, impersonation, and interception of information. Do You Provide a Report After the Risk Assessment Process? We provide a detailed Information Security Risk Assessment Report covering the cyber-risks your organization faces, causes of the threats, the level of effectiveness of your controls, and our professional recommendations for remediation. Venkon will work with you to find existing and potential information security risks. We also provide an Executive Summary which will summarize the longer report so you can get acquainted with it without having to read it all.